Free Shipping via FedEx or UPS Ground to the contiguous U.S. Orders to PO Box addresses, APO/FPO, Alaska, Hawaii, and Puerto Rico are fulfilled with free USPS Parcel Select shipping! We gladly ship to Canada with FREE shipping but you will be expected to cover all brokerage and handling fees via a flat $25 fee that will automatically be added to your order at checkout. Canada Post may also require a small import tax at your door. Per our sizing guarantee, if the incorrect cover is sent we will pay the return shipping costs (within the 30 day return policy)! For more information, you can check out our Return Policy. You can contact us any time that is convenient for you. You may email us anytime using our contact form. You may also call 1-800-385-3603 between 7:30am - 4:30pm PST, Monday - Friday, excluding major holidays. 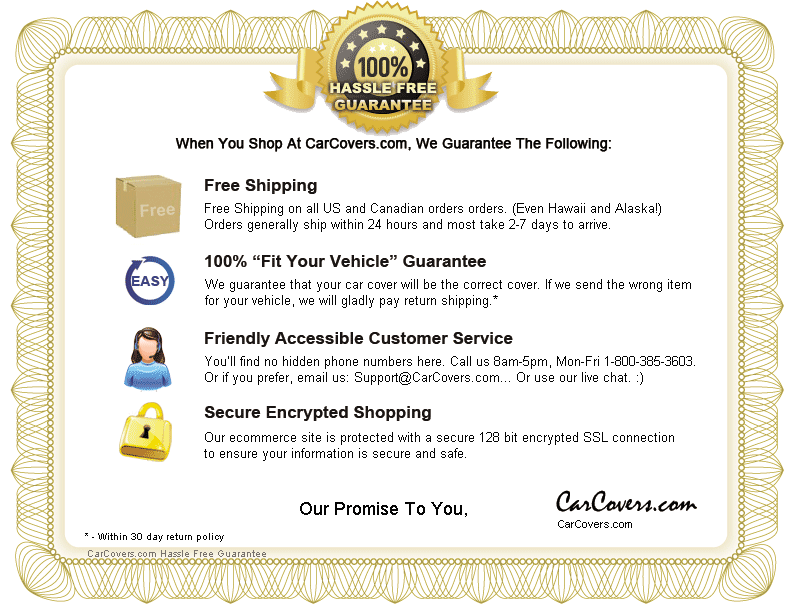 Now that you know CarCovers.com is the best place to buy covers for your vehicle, click one of the following links to find the perfect cover: Car Covers, Truck Covers, SUV Covers or Van Covers!